series Xcaliber Pinstriping Brushes made by Andrew Mack Brush Company are special due to thier short hair length. Only 1 1/2" vs. the average 2" and 2 1/4". This shorter length allows greater control for intricate designs as well as long lines. Only the finest imported blue squirrel hair is used, along with its hard wood handle, Available in size 0000, size 000, size 00 and size 0. Hair Length Out 1-1/2" long. 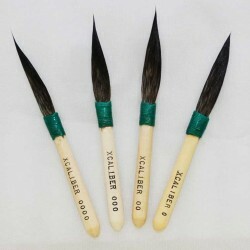 More information and pricing on series Xcaliber Pinstriping Brushes listed below. series Xcaliber Pinstriping Brushes: Sword's longest hairs on top (tip) and tapers back to a shorter lenght on the underside by the handle.